"According to Apple, it is not a design issue. However, the display suppliers have not been informed of faulty display claims and no products have been short listed for a recall. "The display is large compared to the size of the iPod nano at 3.5 inches by 1.6 inches by 0.27-inches. This could cause stress on the display. "Furthermore, iSuppli's Teardown Analysis service revealed that the display module thickness is only about 0.095 inches, and there is almost no clearance between the frame surface and the front end of the LCD display. The structural strength of the display is enhanced by employing protection films, which might be weak because of the use of a vinyl chloride coating instead of a hard coating. All these factors potentially could be related to the reports of cracked displays." "Millions of people listen to music in their cars, and millions of people listen to music on Apple Computer's popular iPod music players. But the two don't mix easily. In fact, it is a real challenge to safely use an iPod in a car, keeping your eyes on the road and your hands on the wheel while navigating through your music. "There are scores of products that attempt to solve this problem, ranging from simple in-car iPod mounting kits to more elaborate gadgets that recharge the iPod and connect it to a car's audio system via a cassette adapter, or an FM transmitter that routes the music through a vacant radio-station setting. Some of these devices also can use a cable that plugs the iPod directly into a built-in audio input jack, if your car is in the small minority of models that have such a jack, or if you have had an installer add one." "The battery icon on an iPod's screen indicates the state of the internal battery. If the iPod is awake a small version of the icon will be displayed in the upper right hand corner of the display. 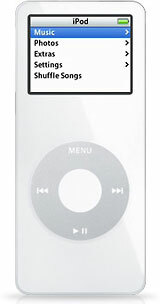 If the iPod is asleep while being charged, a larger version of the same icon will be displayed in the center of the screen. When an iPod is charging, the battery icon changes to a battery with a lightning bolt, and the progress bars on the icon animates to indicate that the battery is charging. If a lighting bolt doesn't appear in the battery charge status icon when you charge iPod, check the connections to your computer or iPod AC adapter." 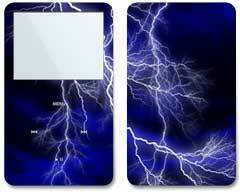 "When you plug your iPod into a power source, the charging icon appears - it's a lightning bolt over a battery. If the battery is fully depleted, you won't see an animated icon. Instead, you'll see the icon pictured below (even on a color screen). The icon indicates the battery is charging successfully, but it doesn't have enough charge to power up. When connecting an iPod with a depleted battery, it may take up to 30 minutes for iPod to have enough charge to turn on and be recognized by the computer and iTunes." When not playing music, iPod sleeps after a few minutes of inactivity. Sleep is the same as if you turned iPod off by pressing the Play/Pause button for a few seconds. To wake iPod from sleep, press any button and the iPod will wake quickly to the menu. By falling into sleep, iPod goes into a power conservation mode but can wake quickly. If iPod sleeps while powered, the charging status appears on the screen. When iPod is not powered and sleeps, the screen is blank. If you wish to have the iPod stay in sleep while it is in your pocket you should deactivate all the buttons by sliding the Hold switch on the top of the iPod to the center. PR: A melding of fine woodworking with high technology, the iWood nano, an iPod case carved out of a block of solid wood by Netherlands-based Miniot.com, scheduled to begin shipping on October 20. "Nothing matches the look and feel of nature. That's why we made the iWood, with love and dedication, from the finest wood. No two persons are alike, neither are two pieces of wood. But there's more that makes your iWood nano unique: a monogram engraved on top. And a message inside. To remind you of all that matters. The iWood nano is carved with the greatest precision from a single piece of wood -carefully selected - in a wonderful patterns and warm colors. Together with nature we offer varieties such as maple, mahogany, pear, wengé, and walnut. Like a good wine or whiskey, the iPod nano reflects your taste and personality. 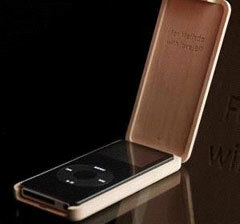 Your iWood nano makes it even more personal, with a monogram of choice engraved on a two line message inside the lid. The iWood nano is discreet and your iPod nano fits in snugly. When closed there's access only for the headphone plug. When opened, the sync-connector is revealed, so you never have to take the iPod out. in its iWood nano, your iPod can easily be operated with one hand. PR: Griffin Technology Inc., announces iTrip for the new iPods. 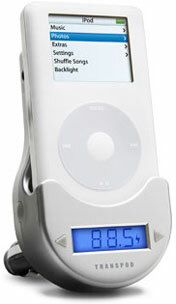 Now compatible with all full sized dock connector iPods, including the newest 5th Generation iPod with video, the new iTrip follows in the tradition of Griffin's iTrip line, with superior performance and innovative features that make the iTrip the most popular iPod FM transmitter in the world. The large, easy to read backlit LCD screen makes setting its digital tuner easy and intuitive. A convenient switch on the side of the iTrip makes it a breeze to select broadcast frequency. But you won't have to adjust the settings very often - iTrip remembers its settings for convenience. The compact, self-contained design makes controlling iTrip a snap, perfect for use in autos. One of iTrip's innovative new features (something not found on any other FM transmitter) is selectable LX or DX modes of broadcasting, which allow you to adjust for the absolute best possible audio under real-world conditions. Even in large cities with lots of radio stations crowding the dial, iTrip's DX Mode delivers a background noise level below that of a cassette tape adapter, allowing the music to punch through cleanly. The results are stunning. Another innovative feature gives you the ability to set the iTrip to either US or International tuning modes. International mode allows access to all available frequencies throughout the world. US mode limits tuning to those frequencies relevant to US stations. The result: no unnecessary scrolling through channels. iTrip requires no batteries, drawing its power directly from the iPod, so there's never a power issue to silence your tunes. Griffin has the iTrip you need for this ever-changing world of iPods we live in. The Griffin iTrip price is $49.99 and will be available online and at most major retailers where iPod accessories are sold in late October. PR: Go mobile in style! The DLO TransPod is the ultimate iPod car accessory. The TransPod plays iPod over your car stereo, it charges your iPod, and it mounts iPod wherever you want it - no mess or clutter. The TransPod broadcasts the iPod's music to any FM radio frequency from 88.1 to 107.9 while simultaneously charging and cradling the iPod in the car. Instead of spending a small fortune on a separate transmitter, charger and cup holder cradle, the DLO TransPod combines all of these features into one elegant, cost-effective device. The new TransPod is a complete iPod solution for your car, yet it requires no installation. This makes it a great alternative to expensive custom installations. Its all-in-one functionality and superior audio performance and sound quality also elevate the TransPod above separate, lower-end, top-mounting FM transmitters. 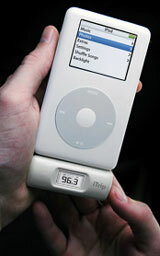 The TransPod works with any dockable iPod, including the new iPod nano. The all-new DLO TransPod features a smaller, sleeker design with a beautiful curved form and easy-access controls. Its new intelligent power control automatically turns the TransPod on when the iPod is docked and off when the TransPod is not in use. It features front-based tuning buttons for easy navigation of FM stations and side-based buttons that control backlight and preset functions. PR: The new Belkin TuneFM lets you listen to the music from your iPod through any FM stereo receiver. Offered in a new, sleek design, the TuneFM plugs into the remote/headphone jack on your iPod. Just tune your stereo to any clear FM frequency, and you can enjoy your iPod music anywhere with full sound and fewer wires. It will be shipping in North America in November 2005. Unlike other FM transmitters, the TuneFM features its own LED display that indicates FM frequency and memory preset - eliminating the need to use the iPod interface for frequency selection. Because the TuneFM is powered by the iPod, no batteries are required. Belkin products are available online as well as through a network of major distributors, resellers, and superstores. The new Belkin TuneCast Auto lets you listen to the music from your iPod through your car's FM radio. Unlike other FM transmitters, the TuneCast Auto powers and charges through your car's cigarette lighter - eliminating the need to drain power from the iPod itself. Its new design and ample features make for an easy, convenient solution to listen to your iPod on the road. The TuneCast Auto will be shipping in North America in late November 2005. The TuneCast Auto features two programmable memory slots, which allow you to toggle between two channels. A blue, backlit LCD provides for easy viewing day or night, and a Velcro® tie reduces cable clutter in your car. And, its included dock connector attaches securely to your iPod. By simply plugging the TuneCast Auto into the dock connector on your iPod and your car's cigarette-lighter outlet, you can enjoy your iPod tunes on the go. Belkin products are available through Belkin online as well as through a network of major distributors, resellers, and superstores. Protective Solutions Inc., a developer of protective coverings for handheld electronic devices, and Applesauce Polish, a provider of polishes for electronic devices, today announced they have signed a joint marketing agreement to provide scratch removal and protection products for the Apple iPod(R) nano. Under the agreement, Applesauce Polish will be used to remove existing scratches and clean iPod nano devices, while future scratches and damages will be prevented by using the Invisible Shield from Protective Solutions Inc.
Applesauce Polish cleans, restores the shine and removes scratches from the plastic front and display, and the metal backing of all iPod models, using a newly developed microfinishing formula. The Invisible Shield is a protective covering that is virtually indestructible, designed to fit electronic handheld devices, including iPods, PDAs, cell phones, watch faces and more, prolonging the life span of such devices. "Scratching has been the single biggest complaint from iPod nano users," said Phillip Chipping, president, Protective Solutions Inc. "The iPod nano is extremely susceptible to scratches and wear marks, just from everyday handling and use. "Our joint solution with Applesauce Polish enables iPod nano users to restore their devices to new condition with polish, while future scratches are prevented with Invisible Shield." Seth Graham, president, Applesauce Polish, said, "Both products offer iPod nano users a means to keep their devices looking new. We reformulated Applesauce Polish to be highly effective at removing even the finest scratches, especially on the black iPod nano." The Invisible Shield retails for $19.95 to $24.95, depending on the model, while Applesauce Polish is available for $19.95 in the United States, with international shipping available. Both the Invisible Shield and Applesauce Polish are available from either www.theinvisibleshield.com or www.applesaucepolish.com. Cleaning cloths and other supplies are also available, as well as product demonstrations, tutorials, and frequently asked questions. Both products are backed by a 30-day, money-back guarantee. Formed in January 2005, Laguna Niguel, Calif.-based Applesauce Polish is a leader in manufacturing quality polishing products for iPod, iBook, and other electronic devices. More information about Applesauce Polish can be found at http://www.applesaucepolish.com or via e-mail: info@applesaucepolish.com. Formed in March 2005, Salt Lake City-based Protective Solutions Inc. discovered it could use a film originally created to protect the leading edges of helicopter blades to also protect handheld electronic devices. Since then, Protective Solutions has introduced 150 products to protect iPods, PDAs, cell phones, GPSs, watch faces, and other handheld devices. PR: NimbleMusic's SmartRip Service turns your CD collection into your own digital music library that loads easily into any MP3 player. NimbleMusic's SmartShow Service organizes your digital pictures into electronic photo albums. Turn you CDs into your own personal digital music library. Installer wizard to move your music from the DVDs to your computer (Mac and Windows). Music library sorted by song, artist, album and genre &endash; allows you to quickly create custom playlists, mix and match individual songs from any of your CDs in your collection. You be the DJ! Order turnaround time depends on the number of CDs you submit. NimbleMusic fulfills a 200-CD order within five business days of receiving your CDs and larger orders within seven business days. PR: The National Basketball Association and Total Impact Industrial Ltd, the manufacturer and worldwide distributor of Slappa storage cases for digital products, announced today the launch of a new line of NBA team protective cases for various MP3 players, handheld gaming devices and other digital gadgets. "The NBA has always been on the cutting edge of utilizing the latest innovative branded merchandise and we are excited to be working together with Slappa to develop another unique product," said Rob Millman, NBA Vice President of Business Development, NBA Global Merchandising Group. "As the popularity of digital devices continues to grow, the new NBA protective cases provide our fans with a great way to further align with their favorite team." "This is a great relationship as the NBA brings one of the most recognizable brands in the world to Slappa's unique product line and approach to design," said Dominick Martinetti, President and CEO of Total Impact. "Working with the NBA and having their logos and team colors on our product, we know that basketball fans will be eager to get a hold of these cool cases." 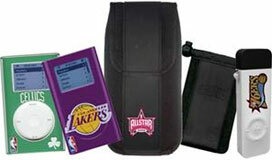 NBA team identified protective cases will be available in the ShockShell, SlipScreen, Gripper, and NeoJacket cases for a wide variety of MP3 players, handheld gaming devices and other digital gadgets. PR: TuneWear announces PRIE jewel, a luxurious iPod case sensation for iPod 4G/photo and iPod mini. Passionate colours, ever-so-smooth soft touch and the pretty design combine to bring you an iPod case that is functional as well as very chic. PRIE jewel is absolutely gorgeous. The Metallic Pink and Stylish Sliver design is complimented with a glittering rhinestone buckle to add an air of glamour. The silver chain is removable and can be used to attach your iPod to your bag, jeans or anything else. With a design this stylish and the reasonable price, you will want one right away. PRIE jewel is not just a fashion accessory. The screen and click wheel of your iPod are protected with a clear vinyl window that still allows you full control. Just like the rest of the PRIE series, we have left the earphone and dock connector open so that you can gain full access. 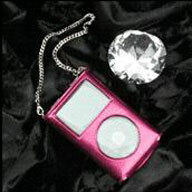 PRIE jewel is available in two models, one for the iPod 4G / photo and another for the iPod mini. 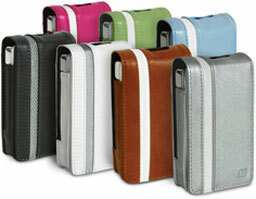 PR: A fun, fresh and high quality carrying case for your iPod! This is not your ordinary iPod case and features the best of functionality, fashion, and style. Bright, funky colors and an ultra-slim design to fit your player like a glove, making this flip style case a great choice for work or play. Once your friends see your case, they'll want one too! "Looks nice and very well made. Made so that the iPod is easy to use." PR: ezGear announces the ezSkin cases for the new iPod nano. The ezSkin Nano cases are made of high quality silicon and have openings on the top for access to the hold switch. The opening on the bottom provides access to the iPod dock connector and headphone jack. Each ezSkin comes with a neck strap, an integrated removable belt clip, and a clear ezShade screen protector. ezSkins Nanos come in five stylish colors &endash; Sky Blue, Princess Pink, Lime Green, Onyx Black, and Frost White. The Onyx Case is opaque and the other 4 cases are semitransparent. ezSkins come with an integrated sturdy belt clip. The belt clip is made of high quality high impact plastic so that it lasts long. The belt clip is removable so you can use your case without it. Each ezSkin comes with a clear ezShade screen protector. ezShades are a clear plastic screen with rubber bumpers on each corner that fits over the screen of your iPod. ezShades for iPod and ezShades for iPod mini are available in 5 pack color screens &endash; pink, blue, clear, orange, and green. The ezSkin Nano suggested list price is $24.98. ezSkin Nano cases will be available in two weeks through iPod resellers and distributors, electronics superstores, and online. PR: The DLO Action Jackets are the ultimate case for the active iPod owner. They're the perfect way to exercise your iPod. 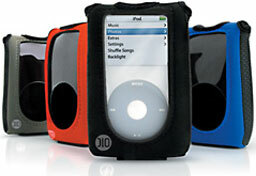 You can take your iPod with you wherever you go using the Action Jacket's workout armband or rotating belt clip. Whatever kind of iPod you have, DLO has an Action Jacket that will fully protect your iPod during any activity. Action Jackets are stylish, padded cases that feature a play-thru design so you never have to remove your iPod to get to its controls. The comfortable, workout-ready armband fits any arm size from toothpick to python. 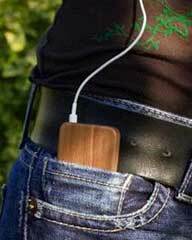 The belt clip securely attaches the iPod anywhere and rotates for a perfect "hipside" fit. The Action Jacket's custom design is a seamless balance of function and style. You can choose from four different colors: red, blue, black and grey. The Action Jacket provides the most protection and mobility available for iPod. It's a case, belt clip and workout armband in one complete package. PR: DecalGirl.com, an industry leader in providing full-color adhesive vinyl skin products for electronic devices announced support today for the newest generation Apple iPod device. DecalGirl.com have announced the release of their removable vinyl "skin" kits for the latest video-enabled version of the Apple iPod. Specializing in full-color, high resolution photorealistic designs, they offer the highest quality skin products on the market today. Beginning with premium vinyl with a patented removable adhesive, the skins are produced using a full-color, UV resistant digital printing process. Once printed, they're covered with a high-gloss protectant layer to prevent smudging, scratching or fading and are computer-cut to precisely fit the device. A strict in-house quality assurance process ensures that each skin is of the highest caliber possible. "We're very excited about the addition of skins to our product line for the new video-enabled iPod. After the recent success of the iPod nano, we're thrilled that the new device shares many of the visual features Apple introduced with the Nano. Our new line of iPod skins includes hundreds of designs, all priced under $7 and each one uses hand-selected, original, high-resolution full-color artwork," said Amanda Peters, Managing Director of DecalGirl.com. "Each of those designs is carefully selected for image quality, level of detail and position on the device; they're meant to enhance the appearance of the device. For the more creative owners, we offer an easy-to-use template that they can use to design their own work of art." Skins can be purchased online at http://www.DecalGirl.com or through any one of the hundreds of authorized retail outlets, websites and distribution partners worldwide. Reseller and distributor inquiries are welcome. PR: Belkin's existing line of iPod accessories include devices that are compatible with the new 5g iPod and are available in both black and white colors, such as the TuneCast(TM) II (F8V3080 and F8V3080-APL) and Auto Kit for iPod (F8V7058-APL and F8V7058-APL-BLK). These products are widely available in North America. Other new and to-be-announced accessories for the 5g iPod will be available starting November 2005. The TuneCast II, an FM transmitter that plays music from your MP3 player through FM radio waves, plugs into the iPod's headphone jack. The TuneCast II is available in both black and white colors, as is the Auto Kit, which charges the iPod in your car. "From last month's introduction of the iPod nano to this week's 5G iPod announcement, Apple continues to demonstrate a comprehensive understanding of the modern consumer," said Mark Reynoso, Sr. VP of Sales and Marketing. "Similarly, Belkin strives to give iPod users inventive tools to help them fully maximize their iPod," continued Mr. Reynoso. "In the next couple of months, you will see an assortment of innovative accessories for the 5G iPod that will provide the consumer with an all-inclusive digital experience."